during the NASCAR Xfinity Series ToyotaCare 250 at Richmond Raceway on April 12, 2019 in Richmond, Virginia. 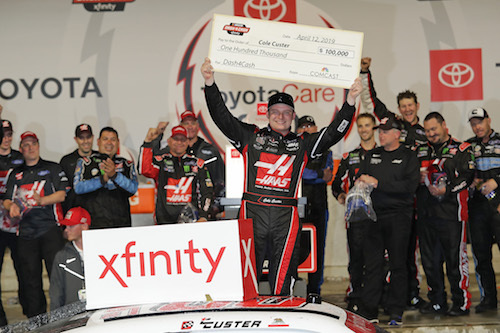 Cole Custer claimed his second NASCAR Xfinity Series win of 2019 on Friday night in the ToyotaCare 250 at Richmond (Va.) Raceway. He claimed his latest win in dominant fashion, leading nearly half of the 250-lap race. Like Christopher Bell at Bristol (Tenn.) Motor Speedway the weekend before, Custer was a winner twice over at Richmond. In addition to the race win, Custer claimed the second of four $100,000 Dash 4 Cash bonuses awarded by series title sponsor Xfinity. “I just bought a house, so I might put it towards that a little bit. I have no idea. We will find out,” Custer said. Austin Cindric finished second, and Justin Allgaier was third. Another D4C driver at Richmond, Tyler Reddick, finished fourth. Ryan Sieg rounded out the top-five. The other two bonus-eligible drivers at Richmond, Chase Briscoe and Bell, who became eligible for the Richmond bonus courtesyof their race finishes at Bristol, finished eighth and 16th at Richmond. Custer, by winning the bonus at Richmond, and Cindric, Allgaier and Reddick, by being the next three highest race finishers at Richmond, will be eligible for the next bonus to be awarded in the next Xfinity Series race, in two weeks, at Talladega (Ala.) Superspeedway. Custer’s 122 laps led included a stage win. He was up front when the second stage ended at lap 150. Justin Allgaier won the first stage that ended at lap 75. 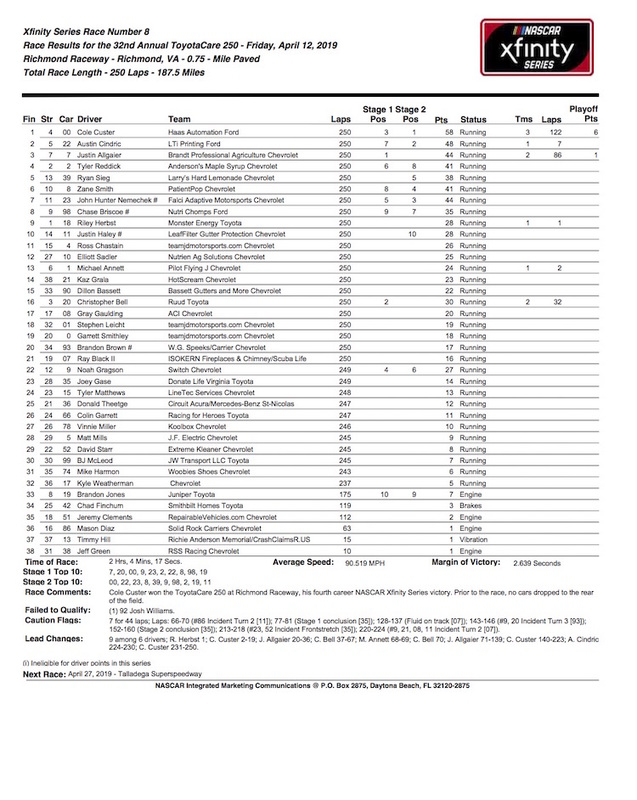 After Riley Herbst started on the pole as a result of the starting grid being set by car-owner points when rain forced the cancellation of qualifying earlier in the day Friday, Custer, Allgaier and Bell were frontrunners throughout most of the race. Allgaier led 86 laps and Bell 32. Cindric was the only other driver to lead more than two laps, running up front for seven. Custer, Bell and Allgaier all led laps early in the race. Bell took the lead from Allgaier on lap 37, but after Michael Annett stayed out to inherit the lead during a lap-65 caution for a Mason Diaz spin, Allgaier took the lead on the restart and ran up front for the remaining few laps of the opening stage. Allgaier was still the race leader when Jeremy Clements blew his engine and brought out a caution on lap 127, but Allgaier stayed out. On newer tires, Custer was able to retake the lead soon after the race restarted. Allgaier fell back several positions on his older tires. A Bell spin on lap 142 resulted in the fourth caution of the race on lap 142 and two pit stops during the yellow. He was still outside the top-10 of the running order when the second stage ended. He eventually got back up to as high as third but didn’t seem as much a factor in the final 100 laps. Allgaier, meanwhile, pitted after the conclusion of the second stage while other frontrunners stayed out. As a result, he restarted 16th, but he was back inside the top-10 right after the restart and was back up to second by the time the yellow flag waved for the sixth caution with 39 laps remaining. Custer was the race leader at that time. Cindric was able to get out in front of Custer on the final restart late in the race, but a few laps later, Custer was able to take his final lead that would soon lead to the race win. Other top-10 finishers included Zane Smith in sixth, John Hunter Nemechek in seventh and Herbst in 10th.